You’ll have big issues with your metal roof if you don’t take care of minor problems quickly and maintain it regularly. The best time to get an inspection completed to check for damage would be after the harsh winter months, before the summer storms come rolling in. These are usually caused by installing fasteners with improper shank length, poor thread design, and improper fastener heads and stress plates. Finding a few fastener back-outs means you’ll need to check the entire roof system. If there are a lot of fasteners backing out, or starting to, you may have to look into replacing your roof. This can indicate that your drainage system is blocked or your insulation is improper. You could have poor condensation lines on your HVAC units or your roof’s slope might not be proper. If you have ponding water and the sun is pounding down on it, it will deteriorate your metal roofing. You have to figure out whats causing the ponding moisture before you try to repair the roof. Always inspect for these issues before starting any repairs that your roofing contractor recommends. Due to the constant exposure to the elements, your roofing materials are going to deteriorate over time, but your inorganic materials will decay slower than the organic ones. If you’re seeing visible signs of decay, get the roof inspected for possible water leaks. There’s a couple of types of flashing used for items penetrating your roof. For single pipes and small vents, the flashing will be installed right on top of the roof’s material and then stripped in. Groups of penetrations and larger items employ metal, concrete or wood curbs with metal counter flashings installed with them. Base flashings that are separated from not installing top wood nailers. Vents and pipes that have movement between them. With a low-slope metal roof, you can place a lot of different types of equipment on it. This could be signs, antennas, flags, ladder struts and bracing, etc. Try not to install equipment that isn’t absolutely necessary and don’t install them right on top of the roof panels. They need a solid support structure with raised curb-type supports. You can keep the roof watertight by using curb flashing or flat flanges. You can then do proper restoration or repair without taking the equipment off. As a result – a metal roofing system without leaks. Adding years to your metal roof’s lifespan, you won’t have to worry about your roof rusting and you’ll get benefits like a long lifespan and utility savings. To keep the aforementioned problems from happening and to easily repair them when they show up, there a few options you can utilize. 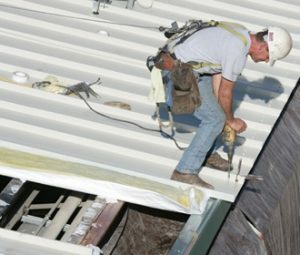 We can help you keep your commercial metal roof lasting for decades by performing our unique roof restoration process designed to prohibit these issues from happening. We have a 5 Year Leak Free Warranty that backs up our methods, materials and process and the experience necessary to recognize exactly what needs to be done to fix your commercial metal roof. No one can compete with our simple, cost-effective process for correcting metal roof issues. We utilize our trusted manufacturers and our experience in the field to train our crew members in the latest technology and processes. 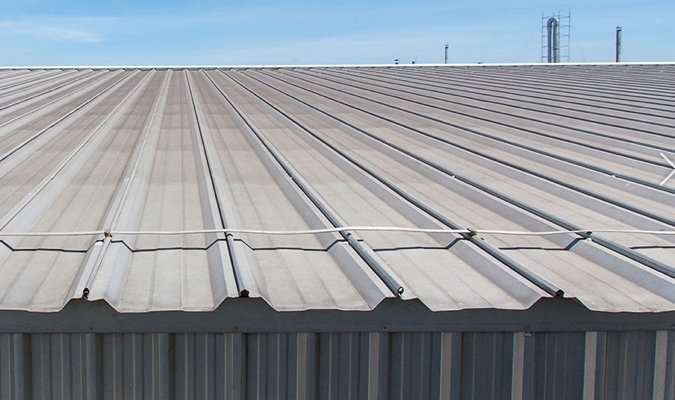 Taurus Elite Commercial Roof Systems, 512-332-4422, provides commercial metal roofing services to Austin, Texas and the surrounding communities. This includes commercial metal roof repair, commercial metal roof restoration and commercial metal roof installation. We have been providing professional commercial roofing services to the area for over 20 years. Give us a call when you need a metal roof repair contractor with the experience you can trust.